Wikipedia article maintained by the FSH Society Journal Club members. Facioscapulohumeral dystrophy: the path to consensus on pathophysiology. Visit our page on Genetic Cause of FSHD for a description of the genetic mechanism of FSHD Type 1 and FSHD Type 2. Many of the seed grants and starter projects have generated data and insights that help with screening for FSHD, improve genetic testing, and ultimately improve the speed and accuracy of diagnosis. 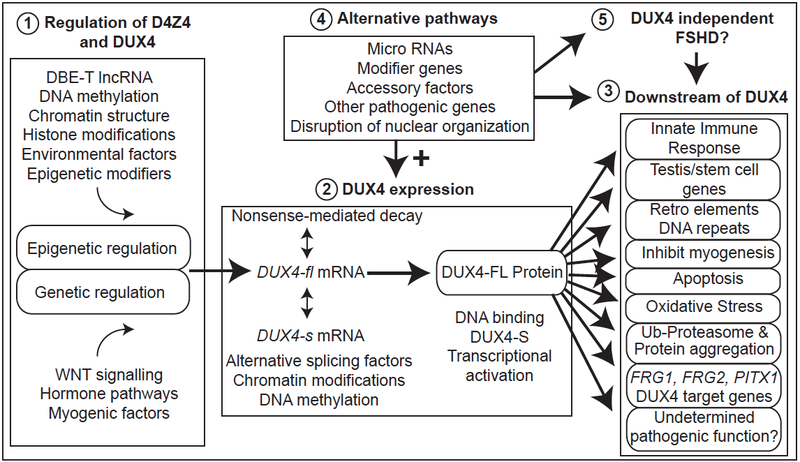 FSH Society seed grants launched the international effort that culminated in the discovery of the complex genetic mechanism by which D4Z4 contractions on chromosome 4 result in expression of the DUX4 gene in FSHD Type 1. FSH Society grants also contributed to the discovery of SMCHD1’s role in FSHD Type 2 and as a disease modifier in FSHD Type 1. In the area of therapy/treatment, we launched two groundbreaking nutritional research projects covering creatine, MRI/MRS, and better biomarkers and techniques to measure clinical trial outcomes and endpoints. Respiratory insufficiency is a serious complication that can happen with FSHD. The FSH Society is assembling a knowledge base and guidelines, and disseminating information on respiratory insufficiency and care in FSHD. The Society helped advise, network, and consult with clinicians, patients, and Wyeth Pharmaceuticals to bring about the clinical trial of the myostatin inhibitor myo-029. The Society met with Acceleron Pharma to make the case for FSHD as a candidate disease for their myostatin inhibitor ace-031. In 2014, the FSH Society worked with aTyr Pharma to recruit volunteers for biomarker studies in association with aTyr’s launch of a Phase I clinical trial of a novel therapeutic compound for FSHD. In 2016, the FSH Society helped launch the nationwide FSHD Clinical Trial Research Network and collaborated with Acceleron Pharma to convene focus groups around the ACE-083 clinical trial. Also see Research News for notable FSH Society-funded research.